I haven’t blogged much about my cancer status or advocacy activities in 2016. Not to worry — I’m still dancing with NED (No Evidence of Disease), still taking Xalkori (crizotinib) for my stage IV lung cancer, and still advocating for improved outcomes and quality of life for lung cancer patients. Life has just been amazingly, overwhelmingly busy up through July, and my blogging became one of the dropped balls in my juggling act. How busy, you ask? Here’s a summary of the past nine months. The numbers are estimates, as I had trouble reading the small print I had to use on my calendar to fit everything in. Sometimes I was barely home long enough to unpack, pile my collected travel papers on the floor, repack, and perform a couple of necessary household chores before flying out again. Glad I’ve had a few weeks at home in July and August to decompress and spend time with my family. While compiling the statistics for this post, I begin to realize why I’ve been so fatigued. I’ve never been particularly good at taking things slow. The above list demonstrates that I must fine tune my advocacy work in order to focus on my top priorities. I need to say “no” to some opportunities so that I can have more time to process what I’ve learned and write. Juggling four conferences in April left me drained–one conference a month should do. As my husband has reminded me more than once, I am a cancer patient as well as an advocate. I’ve been attempting to exercise regularly, give myself enough hours in bed to feel rested, eat healthy, and stay hydrated. Over the past nine months, my medical team and I have also made some tweaks to my treatment plan. Less frequent scans. Sometime last year, I became eligible to increase the time between my scans for the clinical trial, but I was too anxious about my cancer possibly coming back to do it. However, a long talk with fellow lung cancer activist (and 11 year survivor) Linnea Olson at the World Conference on Lung Cancer in September made me realize I was having a LOT of scans over the past years. I realized reducing my exposure to radiation was probably a good thing. So, as of November 2015–at three years of NED–I asked Dr. Camidge to schedule my scans for every sixteen weeks instead of every eight weeks (I wasn’t confident enough to go with every 24 weeks). I’ve also switched from eyes-to-thighs PET-CT scans to chest and abdomen CT scans, primarily because insurance was denying coverage of the PET-CT scans. Change of blood thinners. At the beginning of 2016, I realized the frequent labs required to monitor my warfarin dose would be difficult to accommodate with all my upcoming travel. My Denver and Seattle docs all agreed that my pulmonary embolism (remember that pesky blood clot in my lung’s artery?) probably didn’t represent an increased risk of blood clots from cancer, but instead was just a pile of fibrin sheaths that had sloughed off my power port’s catheter (I’m really good at growing fibrin sheaths). So we switched me to a different blood thinner (Xarelto) that doesn’t require regular blood tests. The downside of Xarelto is that it doesn’t have an antidote if I happen to overdose. Crizotinib is approved! Do I stay in the trial? 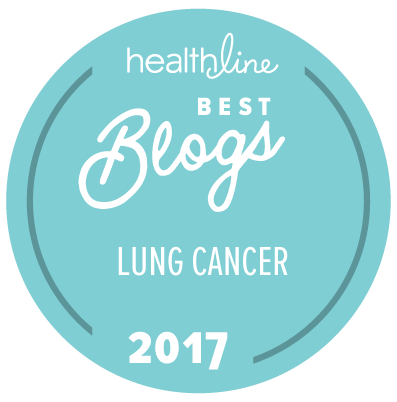 In March 2016, the FDA approved my clinical drug crizotinib for ROS1-positive lung cancer patients–YAHOO! This meant I had the option of leaving the trial and eliminating my travel to Denver while continuing to stay on the wonderful drug that’s keeping my cancer in check. I thought long and hard (with the help of a great blog from my friend Dann Wonser). Eventually decided I wanted to keep seeing one of the world’s top lung cancer docs (Ross Camidge) in Denver, despite the cost and hassle of travel. I love being a part of the University of Colorado (CU) lung cancer SPORE, and I’ve grown close to many people at CU. The trial will likely continue for a few more years; the crizotinib trial for ALK-positive lung cancer started in 2008 and is still ongoing. So. I’ll keep traveling to Denver for the foreseeable future–which is much shorter nowadays than when I was 20. Regaining my balance. After my three falls in nine months, I had several sessions of physical therapy to strengthen my leg and core muscles. It improved my balance and helped me get back into exercising. Alas, I fell again at a conference earlier this month. **grumble** I’ve become a klutz in my old age. At least I’m around to see what my “old” looks like. Dose reduction of crizotinib. I’ve struggled with swelling of my legs and belly–edema, a known major side effect of crizotinib–since my second month on the drug. Alas, it’s gotten worse with time. As of January, I couldn’t bend my ankle at the end of the day if I didn’t wear my thigh-high compression hose and take a diuretic (Lasix). My weight can go up by eight pounds in two days solely from water retention. I’m told edema is the reason patients most often cite for stopping crizotinib therapy. Dr. Camidge first offered me a dose reduction of crizotinib last year (from 250 mg twice daily to 200 mg twice daily), but I didn’t want to reduce the dose while I was also increasing time between scans–much too anxiety-making for me. However, in July 2016 I’d had enough of puffy feet and legs, and decided to try the lower dose. Dr. Camidge says he wouldn’t lose a second of sleep over the dose reduction, because he’s seen the lower dose work for many patients. I think it’s helping me. I can always increase the dose again in the future if necessary, although I’d have to leave the clinical trial if I did. I’m de-ported! I’ve kept my power port while on oral meds, although I only use it for blood draws and scan contrast. The docs have always said it’s my choice, so I’ve left it in because it was easier than getting stuck every month (and my veins tend to misbehave). At my June 2016 clinical trial appointment, however, my power port decided it would cooperate with neither the blood draw nor the scan contrast. I’ve had the little beastie since December 2011, which is a good long run, but I finally decided it was time to pull it out. The surgeon who installed it was thrilled to be taking it out of a metastatic lung cancer patient more than four years later. So, as of July 21, I am no longer Borg. Now that I no longer have a catheter in a vein, I probably won’t be forming piles of fibrin sheaths in my pulmonary artery. My docs say if my next scan in October shows my pulmonary embolism looks good, I may even be able to go off blood thinners. Wahoo! Coping with chemobrain. My continuing fatigue and mental fuzziness are a great frustration. Caffeine and exercise help, but don’t eliminate the problem. I finally asked my oncs what could be done, and they both suggested Ritalin, a stimulant commonly used to increase ability to attend for people who have ADHD. I take 5 mg twice daily on days when I need energy and focus (especially useful at conferences and speaking events). However, it masks how tired I truly am, and results in something of a crash when I stop taking it. I’ll be visiting a neuro-oncologist soon to explore other medication options–Dr. Camidge mentioned Provigil (a narcolepsy drug) and Effexor (an antidepressant) as possibilities, and another patient said she found Concerta (long-acting Ritalin) helpful. So, that’s what happening with me. I promise to blog a bit more often so I won’t have as much news the next time. 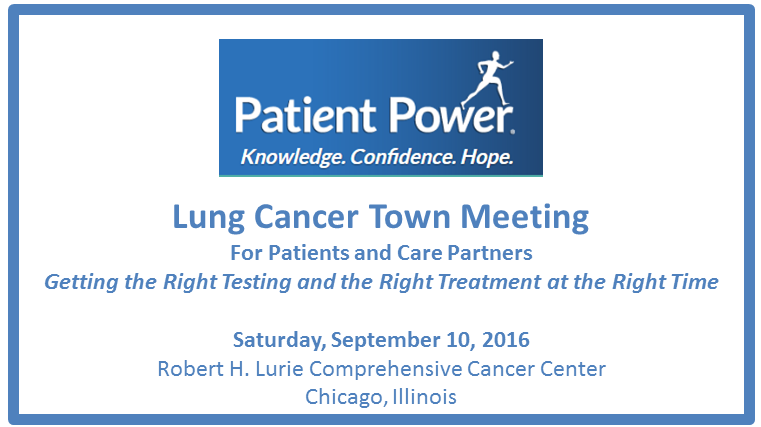 If you or someone you know is a lung cancer patient or caregiver who wants to learn about “Getting the Right Testing and the Right Treatment at the Right Time,” check out this Lung Cancer Town Meeting in Chicago on September 10th (FREE in person or live online). I’ll be hosting several doctors from Northwestern’s Lurie Cancer Center AND my oncologist Dr. Ross Camidge. This in-person town meeting is sponsored by the Patient Empowerment Network through educational grants from Helsinn, Genentech and Novartis, with additional funding from LUNGevity Foundation through an educational grant from Pfizer. It is produced by Patient Power in partnership with the Robert H. Lurie Comprehensive Cancer Center of Northwestern University and LUNGevity. Thanks to Patient Power for inviting me to host it. You can register by clicking here. Hope to see you in Chicago September 10! Over the 4th of July weekend I will be attending Westercon 69 in Portland, Oregon, where I will speak on three panels and conduct one Kaffeeklatsch. I will also be participating in a lung cancer meetup in Portland on Monday July 4 at 10 AM–please post in the comments if you want to be part of it. Patients around the world are changing the healthcare model by becoming partners in their own care. What is an engaged patient, how can you become engaged, and why should you care? Is it black holes, gravitational waves, global warming, a new species discovered, or something else? Which recent discoveries intrigue you most. Is corporate control of research and the drive for short-term profit crippling scientific innovation and basic research? Do established companies always feel threatened by new technology and lobby for legislation to restrict it?